Sierra Nevada Corporation (SNC) announced a successful atmospheric Free-Flight test of its Dream Chaser spacecraft, signaling the program is another achievement closer to orbital operations. The full-scale Dream Chaser test vehicle was lifted from a Columbia Helicopters Model 234-UT Chinook helicopter on Saturday, released and flew a pre-planned flight path ending with an autonomous landing on Runway 22L at Edwards Air Force Base, California. 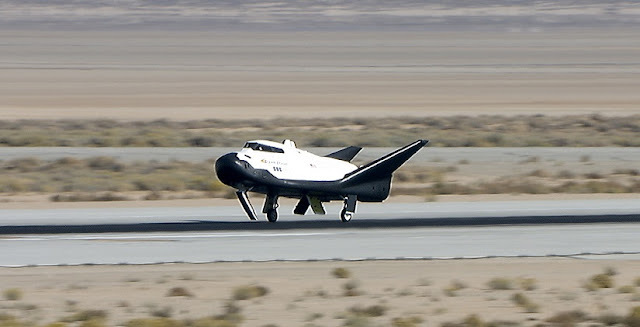 SNC and NASA will evaluate information from the test, including the Dream Chaser aerodynamic and integrated system performance from 12,324 feet altitude through main landing gear touchdown, nose landing gear touchdown and final rollout to wheel-stop on the runway. The Edwards Air Force Base runway is very similar to the Kennedy Space Center Shuttle Landing Facility runway that Dream Chaser will land on for CRS2 flights.